Quick! While Italian (prune) plums are still in season, try this easy dessert that you can get into the oven in ten minutes. 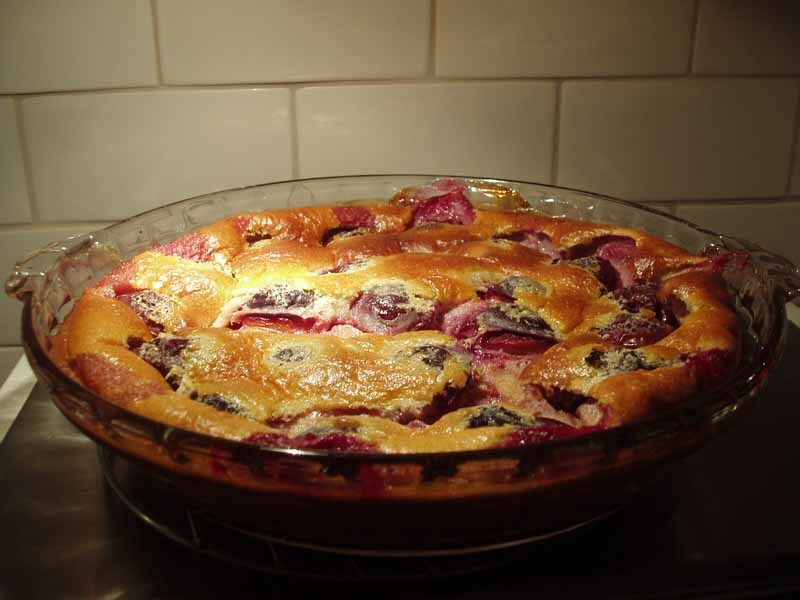 Clafouti is very popular in France, where it is frequently made with pears or cherries. It is a dense, not-too-sweet custard that really lets the flavour of the baked fruit shine through. I often make it with frozen cranberries during the winter, adding one or two extra tablespoons of sugar to compensate for the tang of the berries. Butter a large (9 or 10 inch) deep dish pie plate. Sprinkle 2 T sugar into pie plate, then arrange plum halves cut-side down on sugar. Sprinkle another 2 T sugar over plums. In blender, combine remaining 4 T sugar, eggs, milk, flour, lemon zest, cinnamon, vanilla and salt. Blend until well combined, about one minute. Slide middle oven rack out a few inches and place pie plate on rack. Carefully pour contents of blender into pie pan. It will be very full. Gently slide rack back and bake clafouti for 50 – 60 minutes, until firm. Serve warm, with a sprinkle of icing sugar, or with a dab of whipped cream and a drizzle of caramel sauce. If you have an excess of prune plums, stew then down with a bit of water and 1/2 tsp of lemon juice, then sweeten to taste and served with vanilla ice cream over clafouti. Oh yum! I love Italian plums. They are absolutely the best for cooking, but so hard to find. I will try again to seek them out at a local fruit stand and try your lovely recipe. Thanks.